A Buy Trailing Limit sets the price a fixed amount below the market price. The order moves higher if the market moves above the highest recent price. The order will not adjust if the market moves lower. A Sell Trailing Limit sets the price a fixed amount above the market price. The order moves lower if the market moves below the lowest recent price. The order does not adjust if the market moves up. The following screen shot illustrates a Trailing Limit order priced three ticks away from last traded price. Warning: The Price Mode section and the main Price field are disabled when entering Trailing Limit orders because trailing orders are dynamic and cannot have a fixed price. 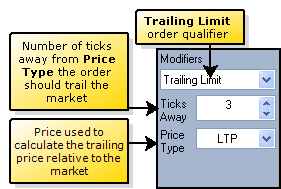 Since Trailing Limit orders are actively working in the market, the TTStatus field displays the order in the Working state. The Synthetic SE continuously monitors the order and dynamically re-prices the order so that it is 3 ticks away from the Last Traded Price. The quantity displays in the Working Qty column because it is included in the exposed depth of the market. Select Trailing Limit from the Modifiers list. The Ticks Away field appears. Set the number of ticks away from the Price Type the should trail the market in the Ticks Away field. Use the arrows or type the number. Select the Price Type used to calculate the trailing price relative to the market. Create an Order Template with Trailing Limit order parameters using the Order Defaults window. From MD Trader, select the Trailing Limit order configuration. Select the Trailing Limit configuration in the Order Type drop-down list. This displays the order in the Working Orders column adjacent to the price..